Today was a day of travel. Slow, unhurried travel without the anxiety of having to be somewhere by a certain time. Just a specific distance to cover. A marathon of a different ilk. I have had many memories of yesterday's run course through my head in the 24 hours since I finished. I plan to take tomorrow off to recap it and post. I was relieved to see the NYCM organizers had my time printed correctly in the New York Times today. I was worried when I saw the Athlete Alert email that went out to a few of you. The alert was correct up to the final time which came out 5 hours plus, which was way wrong. Anyway, the official time was 4:46:44. Hey I beat Katie Holmes! In fact Susan and I must have passed her somewhere along the course because we were the last to start and she ran much slower than we did. I saw many medals around necks in the airport today. A proud crowd heading home in glory. As Mrs. T asked, "What other day would you ever wear your medal?" 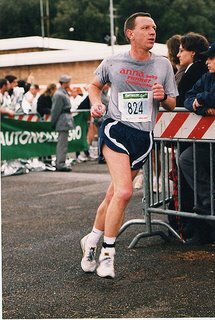 Thanks for the comment on my (former) running blog and the wishes. Congrats for your PR!